In 1886, William T. Price, a mechanic, and Harrison T. Chandler, an investor, formed a company in Cleveland, Ohio for the production of floor-model jobber presses. (See the C&P Oldstyle for more details.) 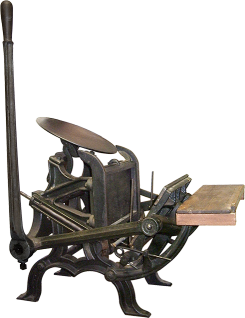 The Pilot was, however, not a jobber but a hand-lever tabletop press that was intended mainly for schools. The Pilot is now considered one of the best tabletop presses ever made; it was manufactured by Chandler & Price until about the 1970s. Until fairly recently, similar presses were still being made by the Craftsmen Company of Boston. Another press, the Columbian C&M lever press, manuafactured by Curtis & Mitchell circa 1885, looked extremely similar to the Pilot. Damon and Peets sold a similar press with a 6 1/2″ x 10″ chase that was called the Favorite Junior Lever press. One of the Pilot’s unique features is that the lever can be attached on either side of the press to accommodate both right- and left-handed printers.